Enhance your productivity with the X-Keys XK-12 Jog and Shuttle. 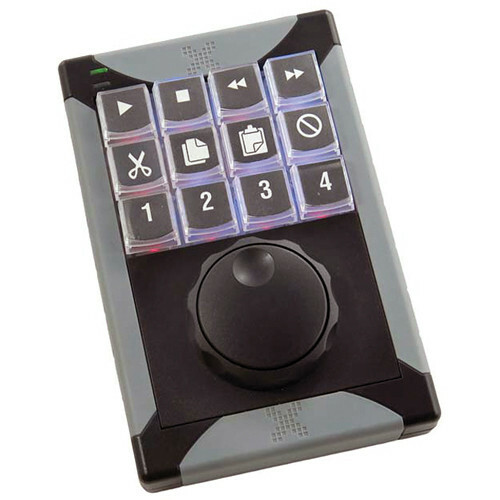 This interface has twelve user-definable keys with a jog wheel and shuttle key that have addressable back-lighting in a low profile footprint. Designed for handheld, mounted, or desktop use, the XK-12 can be used in portrait or landscape orientation. Its full-travel keys mimic the feel of a traditional keyboard and the included angled feet let you give the unit a slight tilt. Blue and red addressable back-lighting enhances key identification in low light environments. Box Dimensions (LxWxH) 8.032 x 6.063 x 3.228"
XK-12 Jog and Shuttle is rated 3.7 out of 5 by 3. Rated 3 out of 5 by Anonymous from Great idea but difficult to program. Great concept but really high learning curve to program for a mac and AVID. Still have not been able to program the jog and shuttle inner and outer rings. The buttons seem easier. There is not much out there for tutorials for the mac application. Best to find someone who has already programmed one. Rated 4 out of 5 by David from Great build quality and easy to program. I like the build quality of the Xkeys job/shuttle device. It gets the job done. My only issue is with the ergonomics. It sits a little high so if you're using it constantly, like I am, you're hand will will feel some strain. I might try placing the xkeys on a mousepad with a wrist-rest which I hope to help alleviate some of the strain. I initially had a Contour Shuttle Pro, but the inner jog wheel failed so I replaced it with the Xkeys. Has anybody used this with FCPX? Can you tell me what functionality it has with that application? Thanks. This has twelve buttons that can be set to any key commands you use frequently in FCPX. In addition to the keys, you can set key commands for the jog dial as well. Does this work with Lightroom? The X-keys XK-12 Jog and Shuttle can be programed for various keyboard emulations so it can be programmed for use in Adobe Lightroom.